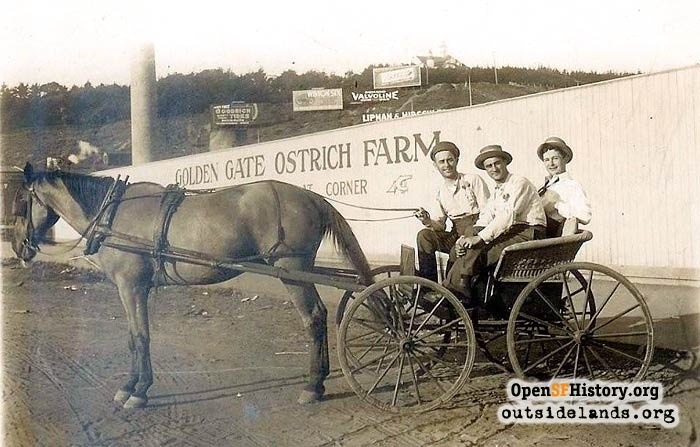 The story of Golden Gate Ostrich Farm at Ocean Beach in San Francisco's Richmond District. Originally appeared in WNP Member Newsletter, October 2012. Ostrich farm exhibit at 1894 Midwinter Fair in Golden Gate Park., 1894 - Photograph by I.W. Taber. 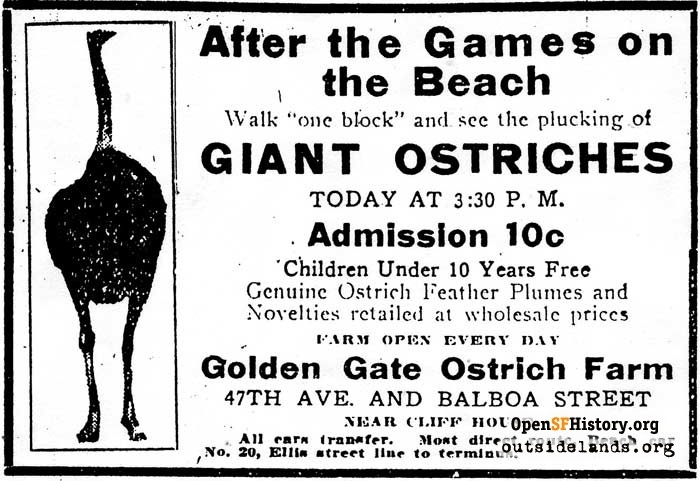 This is one of the most improbable stories in the colorful history of San Francisco—an ostrich farm at Ocean Beach! The ostrich is a native of the grasslands of Africa. What was someone thinking to open an ostrich farm in the fog and wind of the outer Richmond District? African Ostriches have a history in California. They were displayed at Woodward’s Gardens, San Francisco’s first zoo, for three months in 1883. Woodward’s was located in the warmer Mission District, in the area of 14th and Valencia streets. Started as a private collection in a home, Woodward’s expanded to become a nineteenth century version of an amusement park, strolling gardens, natural history museum, and zoo. Ostriches were just one of the many attractions, but they were there to be ogled at, not for their commercial value. 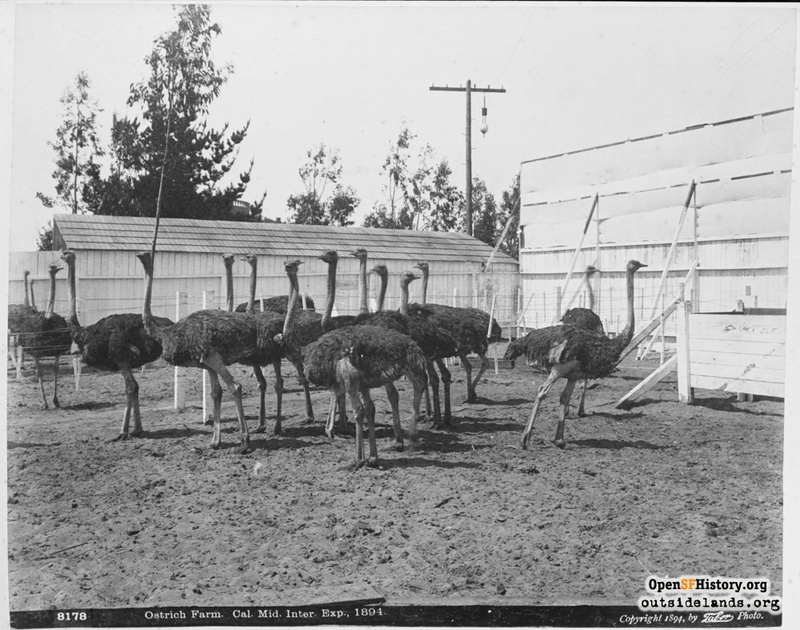 Ostriches were also displayed in a sheltered area of Golden Gate Park’s Midwinter Fair of 1894. By the mid-1880s, ostriches were regularly being brought from Africa to the warm areas of the United States for commercial purposes. In California, two entrepreneurs, Edwin Cawston and Oscar Bentley, obtained ostriches from South Africa and opened competing ostrich farms in South Pasadena and San Diego. These two farms, at the end of special rail lines in the southland, were major tourist attractions. Visitors could view the gigantic eggs, watch the bulge of an orange sliding down the ostriches’ long necks, or have a picture taken sitting astride one of the big birds or in an ostrich-pulled cart. But besides entertainment, there was a practical aspect to the ostrich farm—the sale of the feathers, plucked from the birds and sold “at producers’ prices.” Ostrich feathers were the apex of female fashion, used for feather boas, stoles, and most commonly, as a striking millinery accent. By the early twentieth century, newspapers and magazines ran ads declaring that ostrich farms were a guaranteed growth industry, and either offering booklets on how to raise ostriches or encouraging investments through stock purchases in new ostrich farms. California was touted as “an area particularly adapted to the ostrich.” These promotions were embraced in Northern California and soon there was an ostrich farm in San Jose, and two each both in Oakland and in Sacramento, all offering the same basic format of visiting the gangly birds and buying a product such as a feather plume or hollowed egg. San Francisco was the largest city in the West, and it promised to be a major tourist destination with the Panama Pacific International Exposition (PPIE) scheduled for 1915. From the time San Francisco got the word on February 1, 1911 that the United States Congress had approved it as the site of this world’s fair, the big issue became “where will it be held?” William Randolph Hearst’s San Francisco Examiner championed the mud flats of Harbor View (now the Marina District), while M. H. de Young’s San Francisco Chronicle campaigned for Golden Gate Park as the site of the fair. After months of wrangling, a compromise was struck at the end of July 1911 for a “whole city” concept with Harbor View, Golden Gate Park, Lincoln Park, and the emerging Civic Center as venues for the exposition, all linked with a grand boulevard. Planned for the western gateway of the fair was a long pier at Ocean Beach to lead boat and ferry-arriving visitors into Golden Gate Park for sports competitions held at the Stadium (later called the Polo Fields) and art exhibitions at de Young’s museum. 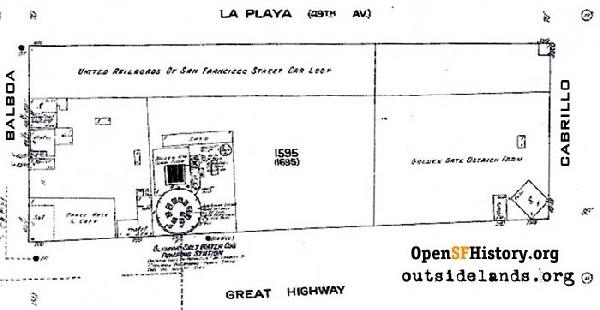 Real estate interests were ecstatic, offering “World’s Fair Lots” in the outer Richmond and Sunset districts, “right opposite the Stadium, facing the Park” for $375 cash and $20 a month over 4 ½ years. The promise of world’s fair traffic to Lincoln Park and the western part of Golden Gate Park also set wheels in motion to develop the adjoining Ocean Beach area. At the time, there was one rail station at La Playa and Balboa Street. Nearby, leading up toward the Cliff House, were saloons, while-you-wait photo galleries, shooting galleries, dance halls, and restaurants. At Fulton Street was a roadhouse and a photo studio. From that cluster of structures, north to the Olympic salt water pumping station just south of Balboa Street, were unoccupied lots ripe for development. A group of men posing in front of the fence of the Golden Gate Ostrich Farm on Great Highway, about 1913., circa 1913 - Courtesy of the Darlene Thorne collection. Once the compromise plan to have the exposition sites in multiple locations was approved, city engineers made Harbor View— where they had to complete a sea wall, suction-pump water from the site and add rock fill to create stable land—their first priority. The concept of the northwest side of San Francisco being part of the PPIE died slowly, as costs at Harbor View escalated and a deal was struck with the U.S. Army to use a portion of Fort Mason for a midway and the Crissy Field area of the Presidio for athletics, auto, and airplane events. The exposition would end up contained to the northern end of the peninsula, but the brief interest in Ocean Beach did lead to new development. The Golden Gate Ostrich Farm was incorporated in late November 1912 and began seeking investors for 7,500 shares of its stock. The owners applied for a permit to open their farm on the north side of Balboa Street, between 46th and 47th Avenues. Because the property was close to Sutro Heights, the Sutro heirs and other neighbors protested that the smells would be offensive. They were overruled, since the Heights and immediate neighbors would not be downwind from the farm and the owners promised sturdy fencing to keep the ostriches from wandering into neighboring gardens. 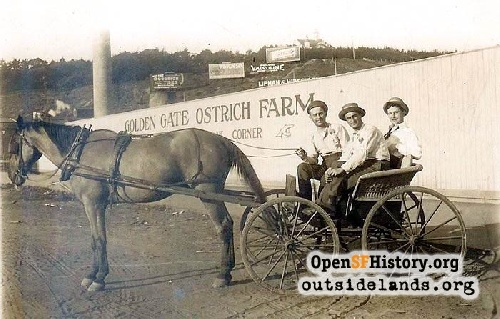 On March 1, 1913, the Golden Gate Ostrich Farm opened for business, touting its fine location near the Cliff House and public transportation. This location was on a wind-swept side of the hill, two steep blocks from the rail terminus of the streetcar that came along Lincoln Way, through the end of Golden Gate Park to La Playa and Balboa Street. The farm was an even farther hike across the unpaved streets from the streetcar that terminated above Sutro Baths. The demonstration of plucking their prize bird, “William Jennings Bryant,” might have drawn a small crowd, but for a venue to be open seven days a week, it would need more visitors to even come close to being profitable. 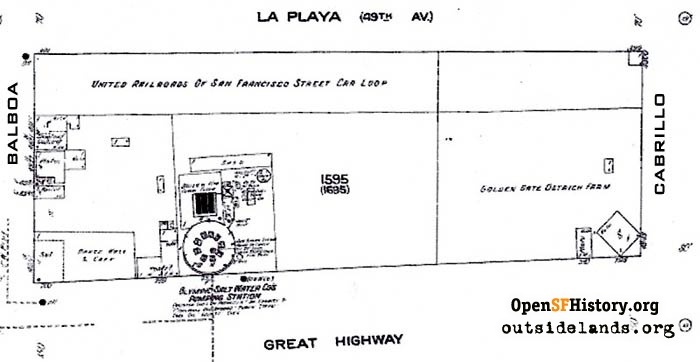 On June 25, 1913, the new municipally owned Geary-line streetcar that had started seven months earlier was extended from 33rd Avenue to the end of its line at Cabrillo Street and Great Highway, completing its ferries-to-beach route. This meant there finally was a second direct route to Ocean Beach, and the owners of the ostrich farm quickly secured a lease for the property on the north side of Cabrillo Street, right in front of the terminus of the Geary line. 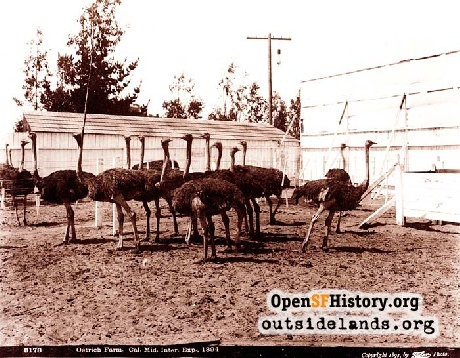 By August, the Golden Gate Ostrich Farm had moved its offices and fencing to the new site, following the successful model of the Southern California ostrich farms by being at the end of a trolley line. The new streetcar line would bring additional investments nearby, and in October 1913, it was announced that Charles I. D. Looff would be spending $200,000 on the other side of Cabrillo Street to build a pavilion to house his carousel, “the first permanent amusement concession for the ocean beach.” An article in the San Francisco Call of October 3, 1913 closed by adding that Looff had plans to spend a million dollars more on an amusement pier. 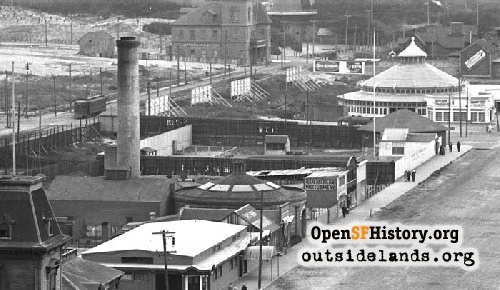 The 1915 exposition did not end up in Golden Gate Park, but the idea had jumpstarted property sales and spurred development in the outer Richmond and Sunset. With the addition of another transportation line to the beach, an emphasis on wholesome entertainment in the three blocks north of Fulton Street replaced the usual saloon and dance hall trade. Things looked promising for the Golden Gate Ostrich Farm’s success, but events in Europe would deal an indirect blow to its business. 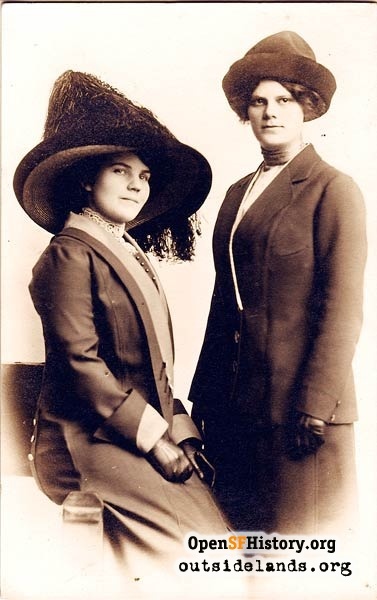 With the outbreak of the First World War in the summer of 1914, Paris millinery fashion became very conservative, abandoning large, flamboyant hats with ostrich plumage for neat turban styles and simple ornamentation. Almost overnight, ostrich feather sales plummeted. 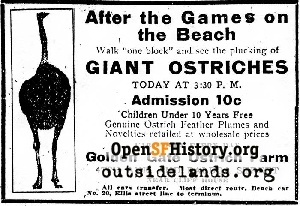 The largest Oakland ostrich farm filed for bankruptcy in April 1915. With a headline reading “whole ostrich for the price of a feather,” a newspaper article explained that the value of an ostrich had declined to the point that a whole bird was worth about what an individual feather used to sell for. Golden Gate Ostrich Farm did not renew its one-year lease in August and “loaned” its 20 birds to Golden Gate Park, which increased the size of its pen that housed three ostriches across from the tennis courts. The park really didn’t know what to do with a flock of ostriches. 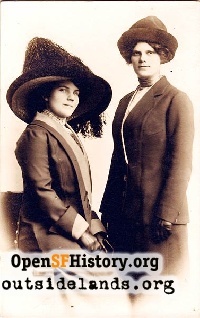 A September 25, 1915, article in the San Francisco Examiner said, “When ostriches went out of fashion in millinery, ostriches also went out of style in Golden Gate Park. The ostrich pens used to attract a great deal of attention, but lately the clumsy birds have been passed by with hardly a glance.” The article went on to say the park administration was able to sell ten of its ostriches to Japan, where ostrich adornments were still popular. By 1916, another Examiner article further told of the sad plight of the park birds, saying park staff had taken to boiling the eggs for one hour before cutting them up and feeding them to the peacocks. The Golden Gate Ostrich Farm lasted five months on 47th Avenue and Balboa Street, and a year on Great Highway and Cabrillo Street. The investors had gambled on a “sure thing” and lost. The climatic conditions near the beach were all wrong for sub-tropical animals, but in the end, fickle fashion played a major role in the demise of ostrich farming at Ocean Beach and throughout the Bay Area. Page launched 5 December 2012.